Because Galapagos visitors spend so much time on and around the water, the sea and shore birds typically receive more attention than the land birds. The sea birds tend to be bigger, more obvious, can be observed more easily, and display lots of different types of behaviors. Land birds, on the other hand, are smaller, drabber, and more secretive. It takes more effort, more patience, and more understanding to observe them. Some birds, like the cuckoo and the rail have small populations and tend to be cryptic in their habits. There are 29 recognized species of land birds living in the Galapagos and Darwin came close to seeing them all. Of course he didn't visit all of the islands and didn't see everything. Darwin succinctly cataloged the resident land birds in the "Voyage of the Beagle:"
*This is a bobolink, which is a regular visitor and fairly common from October to December. 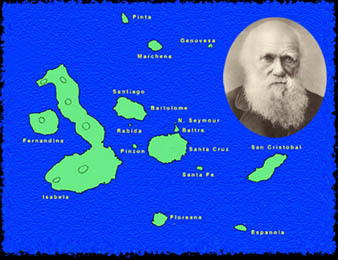 Darwin's first Galapagos entry in his diary is 15 September and his last is 20 October. In 15 visits to the Galapagos, I have seen the cuckoo twice, both in quick fly-bys with no chance to observe, and the barn owl twice. While driving in the highlands, I momentarily saw a rail dart across the road and disappear in the underbrush. I have never seen a martin.Nevertheless, the land birds are supremely important in understanding the development of Darwin's theory of evolution. According to the "Voyage" and his subsequent writings, the three groups of animals that most intrigued and influenced Darwin were the tortoises, the mockingbirds (Darwin's "mocking-thrushes"), and the finches. The table below lists the birds according to whether they are endemic (found only in Galapagos) or resident (maintain breeding populations but are found in other parts of the world). The ratio of endemic to resident birds is staggering. This ratio becomes even more pronounced when one takes into account the fact that many of the resident species are endemic subspecies (indicated by "*"). Perhaps the only difference between the residents and the endemics is that the endemics were in the Galapagos longer. With 13 and 4 species, respectively, the finches and mockingbirds may represent early Galapagos colonizations. The paint-billed crake, on the other hand, was only discovered in 1953 and the smooth-billed ani wasn't sighted until the 1960's. These likely represent very recent colonizations. Indeed, it is suspected that the ani was actually introduced. Unlike typical Galapagos birds, it is very shy and difficult to approach. Use the table to navigate through the Land Birds pages of this web site.